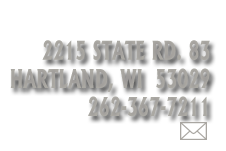 Bryan Becker Clay Werks studio and gallery is located at 2215 State Road 83 in Hartland, WI. Our gallery has personal pottery and art from over 100 national artists. Stop by and find the perfect wedding or housewarming gift, or something for your own home! Get Delafield Driving Directions from Google Maps. Get West Bend Driving Directions from Google Maps. Get Hartford Driving Directions from Google Maps. Get Oconomowoc Driving Directions from Google Maps. Get Racine Driving Directions from Google Maps. Get Kenosha Driving Directions from Google Maps. Get Menomonee Falls Driving Directions from Google Maps. Get Lake Geneva Driving Directions from Google Maps. Get Madison Driving Directions from Google Maps. Get Milwaukee Driving Directions from Google Maps. Get Green Bay Driving Directions from Google Maps. Get Chicago Driving Directions from Google Maps. Get Oshkosh Driving Directions from Google Maps. Get Appleton Driving Directions from Google Maps. © 2019 Bryan Becker Clay Werks. All Rights Reserved.